US President Donald Trump urged China to take decisive action against North Korea on Monday after its latest ballistic missile launch, urging Beijing to "end this nonsense once and for all". "Does this guy have anything better to do with his life?" Trump said of his North Korean counterpart Kim Jong-Un after South Korea's military reported that a ballistic missile had come down in the Sea of Japan. The US military also confirmed the launch. "Hard to believe that South Korea and Japan will put up with this much longer," he wrote on Twitter. "Perhaps China will put a heavy move on North Korea and end this nonsense once and for all!" The missile launch, which authorities in Seoul said was fired from a site near Panghyon in North Phyongan province, came only days after Trump hosted South Korea's new leader Moon Jae-In at the White House. Trump has been urging China -- North Korea's closest diplomatic ally -- to pressure the Pyongyang regime to put the brakes on its nuclear and ballistic missile programs. 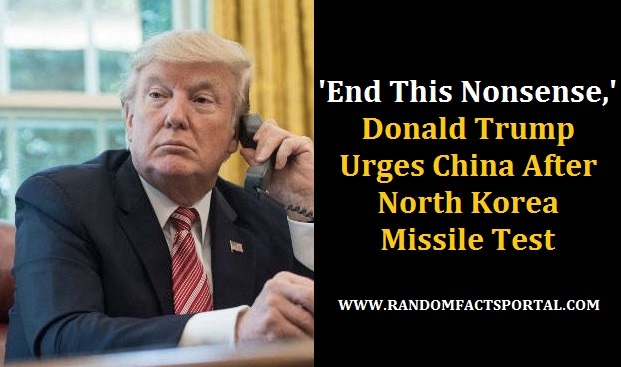 But he recently declared that China's efforts had "not worked out", without spelling out what his administration planned to do so as a result.